English Setters are athletic dogs, keen on sports and activity. They’ll need food packed with dense nutrition to help keep their energy levels up without adding excess weight. Proteins from whole sources should help them maintain muscle tone and keep the joints supported adequately. English Setters are striking dogs, likely causing quite the stir everywhere you go. They’re sweet-tempered and great sporting dogs, dedicated to the hunt and to their families. They’re a medium sized breed, but they’re active. A bored English Setter is a destructive one, which you’ve likely figured out, so you’ll need to support their drive and determination with a nutrient dense food that can keep up with their energy demands. Let’s take a look at what it’s going to take to keep your English Setter in top shape and happy. It’s going to require food with premium ingredients and plenty of care so you guys don’t end up in the vet’s office a lot more than you’d like. English Setters’ hair is one of the defining features of the breed, but without healthy skin, the hair can become brittle and lose luster. Essential fatty acids combined with those quality proteins help keep the skin in top shape and the fur soft and healthy. Later in life, as your Setter becomes less active, it’s even more important to have quality nutrition built into the food. Empty fillers can rob your Setter of quality of life as weight spirals out of control, so foods with only necessary ingredients are essential to health. Setters are generally healthy, but there are a few things you’ll need to look out for as your English Setter grows and ages. English Setters gain weight really quickly, more so than many other breeds. Weight will likely be an issue for their entire lives, so a carefully controlled diet should begin in puppyhood. Avoid foods with empty calories in the form of cheap fillers such as corn or soy so that they don’t have to eat as much while still receiving quality nutrition. Setters are just as prone to hip dysplasia as other types of athletic dogs. The hip doesn’t fit together well, and while you may not notice at first, heavy activity or weight gain can cause pain and possible dislocation. Maintaining a healthy weight is an excellent first step as well as providing foods with sources of glucosamine and chondroitin which help protect the joints. Another genetic condition that can cause lifelong issues, hypothyroidism can be managed well through medication and diet. Dogs with this condition can go on to live happy, full lives, so make sure your food is quality. Foods that help with weight control are great ideas as well as ones that improve digestion to help support medication. Quality protein should always be the first on the ingredient list, especially from single sources of protein. Protein builds strong muscles and coat while helping maintain energy levels. Combine that protein with a complex carbohydrate and your Setter can feel full and energized all day even with smaller meals. Fruits and veggies are another vital part of the recipe because these give your setter vitamins and antioxidants to support the immune system and digestive health. They also provide prebiotics and minerals. Supplementing with essential fatty acids and you’ve got the building blocks for healthy systems all around. Setters benefit from calcium and phosphorus for strong bones plus glucosamine and chondroitin to support joint health. Make sure you keep weight under control to avoid stressing the bone frame. If your setter has constant problems with itchy skin and ears, it may be helpful to switch to a limited ingredient formula to help ease digestive issues and inflammation. Healthy skin starts in the gut, and ultra-sensitive dogs may not be able to handle proteins from multiple sources and a bunch of supplements. Cheap fillers are the worst offenders with weight gain and allergic reactions. Ingredients like corn and soy are often in budget foods, but they have no business anywhere in your dog food recipe. If you see them anywhere in the ingredient list, skip that food. Artificial flavors encourage your Setter to overeat or to eat too quickly which may cause bloat. Artificial colors are there so that you believe the food is healthier and more appetizing. Skip them in your food choices. By-product meals are sources of cheap proteins, but it’s impossible to tell what exactly is in them because they use all parts of the meat, including poor quality pieces. Go for foods with whole proteins and skip the cheap by-product meals. Potatoes, peas, and legumes are often substituted for other ingredients to make foods grain or gluten-free, but a worrying link has been established between these ingredients and Canine Dilated Cardiomyopathy, or an enlarged heart. Talk to your vet about avoiding those ingredients or avoid foods with them listed in the first two or three spots just to be safe. We see these brands all the time on shelves, but they don’t offer much regarding nutrition. Most of them only give your wallet a boost, which you’ll likely pay back later when your dog is at the vet all the time. We recommend avoiding these brands. Pedigree: Pedigree is famous and recognizable, but it uses mostly cheap fillers to fill your dog’s tummy. They also use artificial colors and flavors plus meat by-product meals, so don’t let the bright yellow bag fool you. Kibbles N Bits: Another very famous brand, Kibbles N Bits also uses exclusively cheap ingredients full of fillers and artificial colors and flavors. Do yourself and your dog a favor and look elsewhere for dinner. Alpo: Despite the healthy dog on the front, Alpo has been recalled a lot for both canned and dried foods. The company uses cheap ingredients with plenty of corn and soy for fillers, so don’t fall for the advertising. They have higher calorie needs because of activity, but this should be monitored closely because they also gain weight quickly. Follow your vet’s instructions for your individual setter, but here’s an idea of what to expect. Puppies: Puppies need to grow carefully so as not to stress their developing bones. Make sure your food is nutritious and prepare for your vet to change feeding recommendations several times during your Setter’s development. Adults: Adults will generally receive two to four cups of food per day divided into smaller meals. It depends on your Setter’s weight and the recommendations from your Vet plus portion sizing for the specific food. Seniors: Seniors get similar nutrition, but your vet may reduce portion sizes to help keep weight gain under control. Check with your vet for portion sizing and watch your English Setter carefully for signs of weight gain or slowed activity levels. English Setters need dense nutrition without empty calories to maintain active lifestyles and keep weight under control. They need food to support their sharp minds and athletic abilities, so make sure you pack food full of good things their bodies will love. 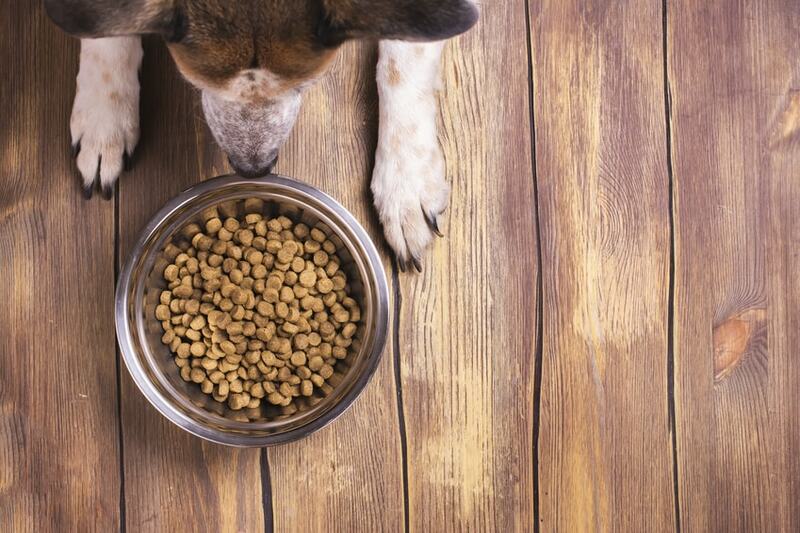 Here are our favorite foods for a healthy and happy Setter for life. Zignature uses only limited ingredient formulas to support healthy digestion and reduce instances of inflammation. Salmon provides high-quality protein with proper amounts of essential fatty acids to help maintain your Setter’s coat health and mental functions. Supplements for overall immune support and better digestion keep your setter healthy and happy. Zignature’s dedication to premium ingredients to support overall health and wellbeing ensures your Setter will have plenty of quality protein in limited ingredient formulas you can trust. They test every recipe first and have a history of providing densely nutritious food for all life stages. Taste of the Wild is another food that supplies healthy proteins with no fillers or grains that can cause allergic reactions. It uses buffalo and venison for a rich protein source plus slow-release carbs that won’t spike your English Setter’s blood sugar. Fruits and vegetables provide vitamins and antioxidants for immune and digestive support. Taste of the Wild uses rigorous safety standards to source ingredients and create recipes. They have only densely nutritious foods with quality protein sources and great vitamins to support overall health. picky eaters may reject the taste. Tasty Turkey Feast is a cooked recipe using human grade ingredients with a single protein source. It’s lower in fat and should help keep your dog’s weight under control. It arrives in perfect portion sizes ready to serve and should satisfy even the pickiest of eaters. Ollie uses recipes created by veterinarians that help you find a middle way between the convenience of kibble and the nutritional value of raw foods. Their meals are prepared with human grade ingredients and appear at your door ready to serve or store. Puppies need to grow carefully and properly. Their developing bones and hips can go through a lot of stress with rapid growth, so finding a food that’s densely nutritious without empty calories is a must. Wellness Core’s food is grain free to reduce the number of empty calories your growing puppy consumes while providing quality proteins from whole deboned chicken and turkey. It includes naturally sourced DHA to support brain development and guaranteed levels of calcium and phosphorus for healthy bones. Wellness’s primary responsibility is providing your puppy with the building blocks for lifelong health. They use a holistic approach and plenty of science-backed advice to create recipes that are nutrient dense and highly effective. Nutro’s wet food is excellent for just weaned puppies or picky puppies who need encouragement to eat solid foods. It offers stable proteins from lamb, and although Setters aren’t precisely large breeds, this formula specifically for large breeds should help prevent your puppy from gaining too much weight too quickly. Now that Nutro is more widely available, all pet owners can take advantage of its quality recipes and complete nutrition for all stages of life. Your puppy gets all the building blocks for health and well-being for a lifetime. At this point in your Setter’s life, it’s critical to maintain optimal weight to prevent long term issues. Foods with weight control options are great, as are ones with plenty of fiber supporting digestion and fatty acids for brain health. Glucosamine and chondroitin can help keep joints cushioned and in good health to support the body. Now Fresh’s weight control formula doesn’t make you choose between weight control and senior options. It has superior nutrition that supports digestion, mental functioning, and keeps the joints healthy. It has no fillers or artificial ingredients and also includes supplements to support the heart. Now Fresh uses a holistic approach to the canine ancestral diet using ingredients sourced from trusted places and only premium foods. It produces excellent kibble to keep your senior’s weight under control without sacrificing any of the energy your Setter will need to stay active. Blue Buffalo’s formula uses LifeSource Bits, a combination of vitamins and antioxidants that support all systems. Chicken and brown rice form the perfect combination of quality protein with complex carbohydrates, giving your Setter energy all day long. Glucosamine and chondroitin support joints while fatty acids keep minds sharp. Blue, the Airedale Terrier, captured not on the heart of the family that started Blue Buffalo but inspired the entire dog food brand. The search for quality nutrition is where everything began, and now you can provide your senior Setter with the same nutrition as beloved Blue. Your English Setter deserves a lifetime of fun and love, so make sure the food you choose has all the building blocks for great health from the puppy years to the senior years. Setters gain weight quickly, so monitor their activity levels closely to help you make better decisions about their food. Understanding their nutritional needs is critical. They’ll require a lot of calories to keep up with an active lifestyle but can gain weight in an instant if the balance is tipped. Otherwise, they’re a loving, supportive dog breed with plenty of life to give, so providing them with food you can trust should keep them happy for a lifetime.